Vetlanda BK is by right called a factory of bandy talents because its club system for decades regularly gives bandy community not just highly skilled masters but the worlds stars who are in a great demand at the most successful elite teams. Local bandy school in recent years particularly is one of the most distinctive in Sweden and has its own unique character style. Vetlanda’s production line had output this season a 18-years old Daniel Johansson who is today one of the most successful young players in Sweden and who has confidently taken over his place in a start lineup at the master team. This could be perhaps due to the fact that children and youth teams of Vetlanda, in which Daniel played, never considered to be strong. Those days in Sweden the other teams as Hammarby, Boltic-Göta, Tillberga and Åtvidaberg among boys born in 1995 have blared. But nevertheless Johansson has always been a prominent leader at his team. 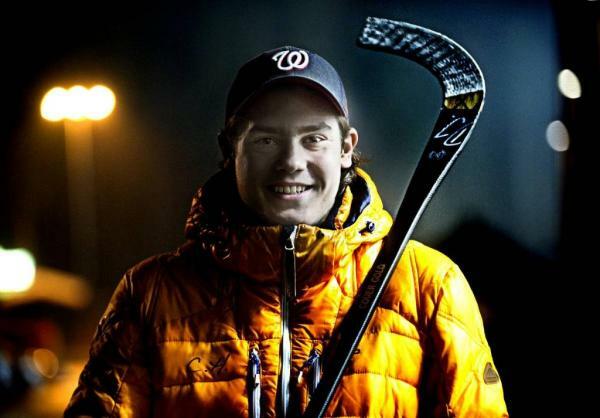 Namely bright leadership, spectacular technique, physical strength, powerful shoot and good vision of the field are features that provided his regular presence at junior national teams of Sweden. The first success came to Daniel in the season of 2009-10 when he became a world champion in Finland among boys no older than 15 years. This fact allows in Sweden certain benefits but the most one is that this automatically opens the doors to the first team. So the next bandy season 14-years old Johansson begins with the master team of Vetlanda. This is a rhetorical question how to foster a good bandy master? For many even the most successful clubs on elite level this remains an unresolved issue. But not for Vetlanda with their more than only successful traditions in a process of stars’ fabrication. They know what to do with young bandy talents. The matter of healthy protection is a key in this case as well as a patience. Neither the one nor another bring any troubles in Vetlanda. The balance has brought to perfection. Daniel had a luck with his coaches. Mattias Renholm, who was simultaneously a part of trainers staff at Vetlanda BK and a head coach at U17 national team of Sweden, provided Daniel this healthy protection both them were needed — one as a coach who was in demand of a strong team leader and another one as a player who looked for a vital playing practice on elite level. So Johansson already in his age of 16 has made a debut in Elitserien along with regularly getting his playing time there. This does not mean however that a young man holds well on competition in the senior bandy with his playing and physical conditions but it had to be done if the club wants to fabricate the perfect bandy product from a high-grade initial material. Even then in his first in the Big bandy season Daniel has shown he has the essentials that is developed thinking and, let small, but steady raise of his skills. All he needed was a patience of coaches and team mates and, probably the most important, time. If he had been more experienced that time everyone had to start talking on him 2 years ago. But experience is the matter that can be acquired. It has finally taken exactly 2 years of work, faith and patience. Another important mentor figure in the life of young Johansson has become Sergej In-Fa-Lin. A top-class in a very recent past bandy master Sergej at the end of his playing career began working in Vetlanda as a coach responsible for junior and youth teams of the club. Result did not come late. Youth of VBK learned fast to play rysskij hockey while Daniel got the necessary professional facet he was lack of which gives a product its exceptional value and brings any high-quality material to perfection. Johansson’s talent has flourished now with new bright colours.